This methods is used in couture to make a flat pireces of fabric conform to a shape. 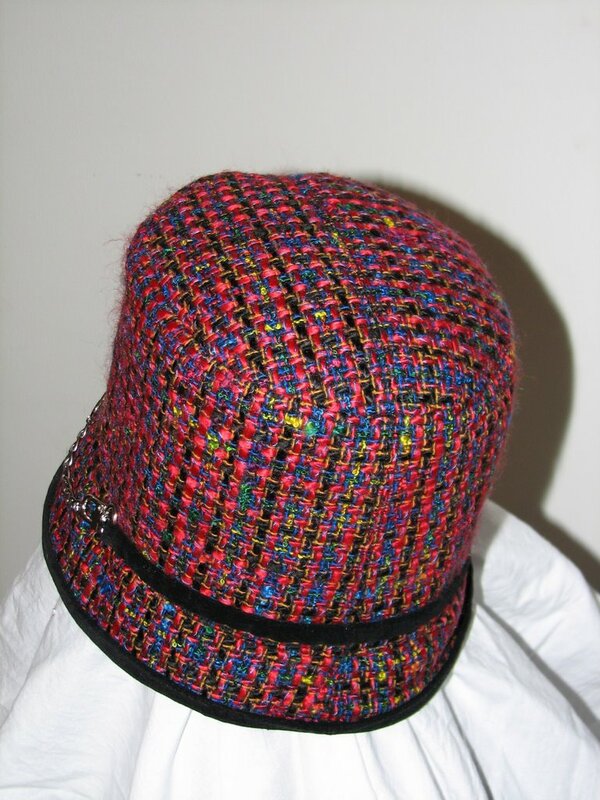 You’d use it when you don’t want to disrupt a stripe or plaid with a dart or princess seam. 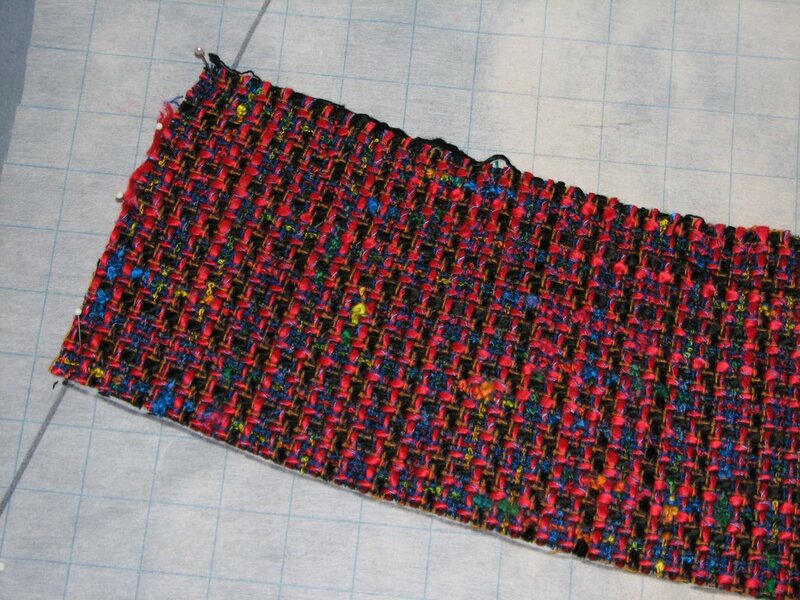 It’d also used to keep a stripe or plaid fabric on grain with the edge of a lapel. This works only with 100% batural fibers that shrink such as silk, wool, or a combinations of the two. If you’d like to try this technique, a hat like this (Vogue 8306) is a good first project. I used it because because I wanted to preserve the horizontal lines of grid pattern in the silk boucle all the way around to the center back seam. As you can see from the crown piece template below, if I had cut the crown piece out the usual way the grid would be slightly on the bias as it moves towards the center back seam. This is the template I mention above. The pattern piece for the crown was traced onto grided pattern paper. Center front is marked, and the ends are drawn out to make easy-to-see refernce points. You will also need to cut out a full size pattern piece for the crown. The crown piece is just a rectangle the same width as the pattern piece, and slightly longer. Step 3 – Lay the Fabric on Top of the Temaplate. Set your iron to full steam and a high setting. Use a press cloth (silk organza is perfect you have it so you can see what you’re doing) and shrink press the ripples out of the top edge. Don’t be afraid! The ripples really will press out almost like magic. It may take a few tries to get them all. But when the piece is nice and smooth, let it dry completely on your ironing board. Now you’re done! As you can see above, the piece is now curved, and the back seam is on the straight grain. You can now use your full size pattern piece to trim the edges of the curved piece. You now have a beautifully curved piece of fabric that retains the original fabric grain, as you can see form the back view of the hat. The brim was also shrink pressed using this same method. I like this technique because it’s actually not sewing. Most people assume couture always means excruciating hand sewing that’s just impossible to learn, when in fact, many techniques are easy to do; they just take a little longer. The end results, however, are always worth the effort. There are more details on this project on Pattern Review. Also, a big thanks to Diva Ann, who gave me the fabric and supplied the handbag clips used for the embellishment! Description: From Burda’s Website, “Pullover in normal width but in narrow look, with V-neckline. 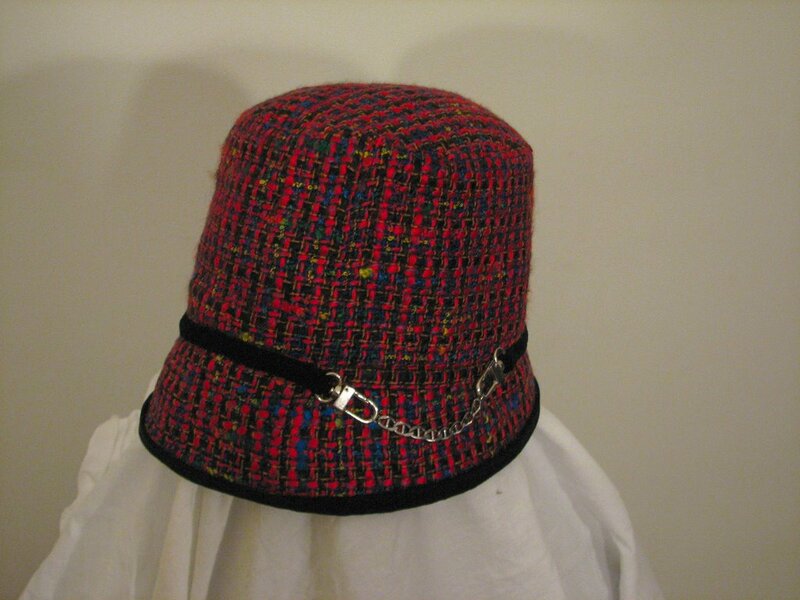 You can choose between a neck panel and or various collars. A,B & C are the long versions with broad hip level waistband which will look particularly attractive with narrow trousers/pants.” I made View C. Here’s the Technical Drawing. Fabric Used: Wool ribbed sweater knit that I bought at Metro Textiles in New York when I was there with Barbara and Carolyn two weeks ago. Pattern Sizing: 36-50. I used 40, In all honesty, I should probably use size 38 and adjust the full bust and the hips. The shoulders are more dropped than I was expecting, though now that I look at the photograph, they are pretty dropped on the model, too. Comments on the Instructions: This was a pretty straightforward pattern for the most part. The only tricky part is the collar. I found the collar instructions mostly unintelligible when it came to the pleat, and in fact I ended up putting the pleat on the inside of the collar. The line drawings show the pleat on the outside. It’s not noticeable, so I will leave it. But I wouldn’t recommend this for folks who haven’t a pretty good sewing background. Other than that I didn’t use the instructions too much. I spent more time playing with the tensions on my serger and sewing machine to avoid stretching the sweater too much on the horizontal grains. The other thing that I did differently is the sleeves. Why do pattern companies insist on having you do set in sleeves in knit garments? This sleeve doesn’t have that much ease in it. Instead of inserting it using an eased-in method, do yourself a favor and sew it in shirt-style, before you close the side and underarm seams. This will make your life so much easier. General Comments: This is a very cozy pattern. I made it up slightly differently than the way they recommend, because I was trying to get kids to football practice and games, and helping them with projects and making their Halloween costumes. But the pattern is well drafted, and I’m sure without all the distractions it would go together beautifully. I would also recommend making this into a dress. To do that, don’t bother to fold the hip band, just attach the top of the band to the bottom of the body of the sweater, and use a 2 inch hem at the bottom. I almost left it that way, but I decided I want a tunic sweater more than a dress. I may morph this into a dress for another version though. If I do, I’ll probably just tape the hip band pieces to the sweater body and cut them as one piece. Conclusion: A great sweater pattern. I wish I could find one that has similar styling but is a cardigan. Time to draft one of my own. I finally got around to doing a tutorial for making the beaded tassels I blogged about in August. Just head over to Obsessed with Embellishment for the how-to. Now I can finish up a reverse color version of this same cardigan, which will be in black wool crepe sweater knit with cream velvet bands and passementarie double buttons that I’ll make myself, similar to the ones Diva Ann made for her Vogue coat. Kelly, one of our friends here on Sewing Divas, posted to her blog a great photo of a funky primitive table made from vintage wooden sewing spools! You must go to her blog and scroll down to the bottom to see the photo. Very cool – the ghosts of sewists past are still with us. After I posted my tutorial on machine rolled hems, I was asked about sizes of hemming feet. This photo shows some of the feet from my collection. From the left, they are: a straight-stitch hemmer and four various zigzag or shell hemmers (don’t feel bad, I’ve never been able to tell a difference between the two). Personally, I think the straight-stitch hemmer is not really necessary – I’ve actually never used it. The narrower zigzag hemmers are handy for very fine fabrics such as silk chiffon *but* this is not my preferred method so, again, I rarely use these hemmers. The ones that I actually use the most are the two on the far right. The narrower one is great for making shell and lettuce hems on fine knits and lingerie and the wider one is perfect for napkins and shirts. If I had to choose just one, I’d choose the wider one as I think it’s the most useful all around.